Understanding product life cycles is vital to effective marketing and successful business. Product life cycles are like stockcharts for marketing. If you own your own small business, you may only be just hearing of this concept now. Do not worry, you are not far behind. This post will provide you with a comprehensive guide to the stages of product life cycles and what each means for your business. The first stage to any product life cycle is the introduction stage. This stage is, as one would assume, the period during which a product has just been introduced to the market. During this stage various product life cycles, promotion and advertising seek to raise awareness for the product. At this time, you can choose to focus on market penetration, getting the product to reach as many customers as possible, by pricing your product at an accessible level. Or, if you are more concerned with recouping production costs quickly, you can choose to keep pricing high. This is especially beneficial if you would like for your product to be considered luxury or high-end. If you are only just now learning about product life cycles, remember that the first stage, introduction, is centered around marketing the product to reach as large an audience as possible. The next stage in all product life cycles is growth. During this stage, product sales increase. Coincidentally, this is also the point at which competitors begin to crop up. To combat this, a company may choose to add extra features to their product or provide additional support to customers. In doing so, the originators of the product are able to stay competitive against similar products being sold at cheaper prices. As a business owner, this is where you will have to be careful to make wise decisions. You may wish to expand the market presence of your product or create a successive generation for it. Whatever you do in the growth stage of your product’s life cycle, make sure it will aid in increasing market preference for your product. This will help to delay the next stage as long as possible. Maturity is the third stage in product life cycles. At this point, marketing for your product has somewhat leveled off, as have sales. Sales are still high however, they are no longer growing. It is at this point in product life cycles that your business should begin to invest more money in development of new products. You may also choose to ramp up advertising or use tools for optimizing Amazon to maintain market presence. It may be wise to lower your product’s price, as well. This will help to delay the end of the product’s life cycle. In that maturity stage of many product life cycles, emphasis should be placed on development of new products and maintaining current market position. All good things must come to an end. The same is true of good products. During the decline phase of all product life cycles, sales have begun to decline. At this point, it is wise to slow production of your product, until demand has become so low that production is no longer warranted. You must also make sure not to waste any money on marketing efforts during this stage. The market has become saturated, and your efforts will only be a waste of precious capital. Instead, use this stage as an opportunity to focus on your new product ‘s development. Then, as this product’s life cycle comes to an end, your business will be able to immediately rebound with another innovative, exciting product. If you want to extend the product life cycle for a while longer to have a shot at improving sales, utilize the strategies mentioned above. They will not put off the inevitable depreciation formula for long, but it may be worthwhile in some instances. 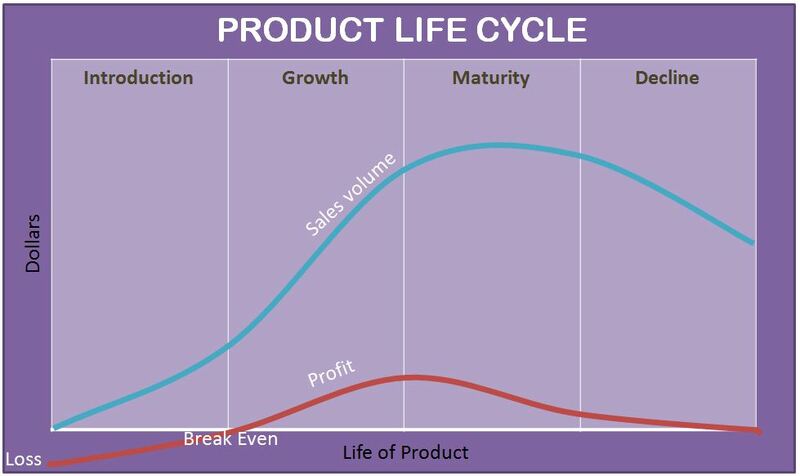 If you are a business owner who is new to the concept of product life cycles, allow this post to serve as your textbook. Product life cycles may vary depending upon many different variables. Introduction, growth, maturity and decline may not all last equal amounts of time. Some products may skip straight from introduction to decline. However, it is important to make note of this marketing tool. Bookmark this page and re-visit whenever you need a quick refresher on the phases of product life cycles.